We all know how useful and addictive mobile phones can be - most of us can't remember how we survived without them - and they can be very useful for your children to have too, especially if the route home from school involves public transport or independent travel and you want to be able to ensure that your child is safe and have a way of contacting him or her. 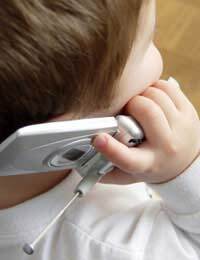 Mobile phones can provide a useful way for you to contact your child, especially if you have several children and several after school activities to coordinate - if you run into traffic, for example, it is relieving to be able to contact your child to let them know you are going to be late. Within the classroom, however, mobile phones can also be very disruptive - think how annoyed you get when a phone goes off in the cinema, and imagine that interrupting you as a teacher: it would disrupt the class and the attention levels. For this reason, most schools have introduced mobile phone usage policies. These may outrightly ban the use of mobiles within school, or may have more lenient policies, such as mobiles only being allowed after school or in break times. Most schools will clearly outline their policy on mobile usage when a child starts at the school, perhaps through sending a letter home or through a general school rule document sent out to new pupils. Be aware, however, that this practice is more common in secondary schools than in primary schools, which might not have a written mobile phone policy, but a set of less formal guidelines that they follow. If you are considering buying your child a mobile, it is important to know whether they are allowed in schools, so it's a good idea to look into this before laying out a lot of money on a new phone. This letter format laid out below shows how parents can write to a school to ask for information about the school mobile phone policy. It is based on a fictional family's contact with their school. My daughter Kaley is in year 6 at The School House and has started to come home alone on the public bus. She has a long walk at the start of the bus route and I work, so she comes home to an empty house, and my concerns about her safety mean that I am considering buying her a mobile phone. Before I do so, I wanted to enquire about the school's mobile phone policy. Are they allowed in school? Would Kaley have to hand it in at the start of the school day? Would there be a safe place for her to keep it? I look forward to hearing from you about this. You can contact me, Mother, on 0131 2343 9049 or 0723422342, or email me at mother@parents.com, or via the address above.